You're a conscious consumer. You care about the working conditions and environmental consequences. You seek out food, clothes, and electronics that are sustainable, fair trade, and known origin. Why should fine jewelry be any different? Ada's laboratory grown diamonds are guaranteed to be of known origin, sustainably grown in state-of-the-art facilities operated by well-compensated employees. Ada Diamonds knows exactly when, where, and how each of our diamonds were grown. In stark contrast, it is virtually impossible to know when or where a mined diamond was extracted from the Earth. As such, it is nigh impossible to know the true social and environmental consequences of a mined diamond. Ada's founders refused to settle for an unknown origin diamond engagement ring and founded Ada Diamonds to help others build compelling, ethical jewelry that brightens the world. If you work at a jewelry store, there is one question you fear above all: "Where do your diamonds come from?" Why? Most jewelers don't have a clue where their diamonds came from. If pressed, most jewelers will give a vague answer and try to quickly change the subject. What about the Kimberley Process? That stopped blood diamonds decades ago, correct? In a word, no. The Kimberley Process is quite narrow in scope, only banning diamonds from countries with active insurgencies. By refusing to use mined diamonds in our jewelry, we can guarantee that all the diamonds we offer are conflict free and in no way connected to the dubious diamond trade that continues to flourish to this day. Mining diamonds is the definition of unsustainable. The extraction of diamonds is fossil fuel intensive, environmentally damaging, and becoming less efficient every year. In stark contrast to mined diamonds, lab created diamonds are sustainable, vegan, and eco-friendly. How can we make these claims? The growth of diamonds only requires two main ingredients: carbon & electricity. Today, the most efficient diamond producers require approximately 250kWh of electricity to grow a 1 carat diamond, which is the roughly the same amount of electricity the average US household consumes in a week. Furthermore, diamonds can be grown wherever renewable energy is available. The lab diamond market primarily exists to create high-tech uses for lab diamonds such as laser lenses, surgical knives, high pressure anvils, and water purification systems. Earth-extracted diamonds are not suitable for these applications; the only option is lab grown, which continue to have high research and development costs. When you purchase lab diamond jewelry, you are directly funding research & development of functional uses of diamond that improve humanity. All of Ada's diamonds are classified as Type IIa, a purity level found in less than 2% of mined diamonds. Type IIa diamonds are the most valued and the purest type of diamonds in the world. They contain little to no nitrogen atoms in the crystal structure. Some notable examples of type IIa natural diamonds include the Cullinan diamonds, the DeBeers Millenium Star, and the Hope Diamond. Due to the absence of nitrogen during the growth of white diamonds, all of Ada's white diamonds are considered type IIa. We also offer fancy colored diamonds in blues, pinks, yellows, and grays for a fraction of the cost of equivalent natural stones. Your love is one of a kind, your jewelry should be too. Ada Diamonds is proud to offer bespoke lab diamond jewelry, custom made-to-order for each client. Our Diamond Concierge process ensures your experience is uniquely your own. Whether you'd prefer to iterate off of one of our 200+ collection pieces or create a unique piece from scratch, your Concierge will go to great lengths to ensure you receive superlative quality jewelry designed to last a lifetime. Anything you can imagine, we can create. Ada's diamonds are pure carbon; they are not a hybrid of carbon and any other element, nor are they a simulant of carbon. 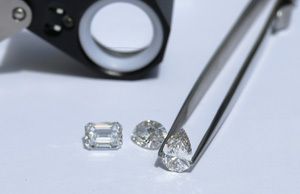 Laboratory grown diamonds are graded on the same quality characteristics as mined diamonds and exhibit the same variance in color, clarity, and size. 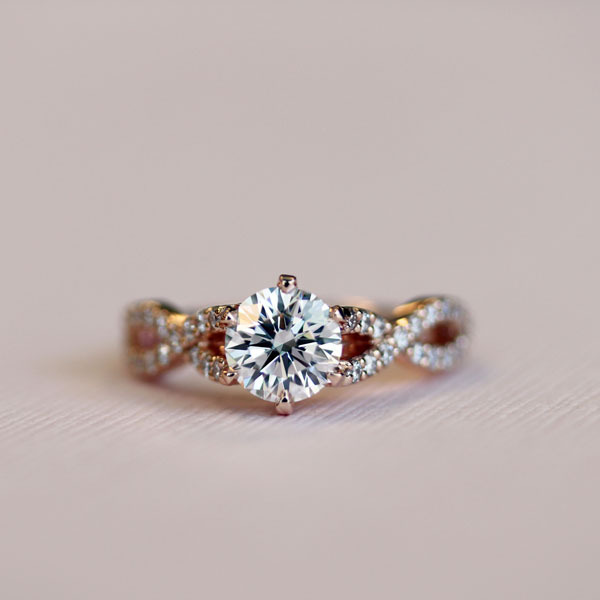 Because we are recreating the conditions of nature, lab diamonds are not all colorless, flawless, or "perfect." Lab diamonds are also priced based on their quality; a D IF lab diamond will be much more expensive than an H SI1 lab diamond of the same size. Ada Diamonds only works with H+ color, eye clean clarity, and lab diamonds selected for the cut and light performance. It takes about 1 week to grow a 1 carat diamond. However, not every diamond grown in a machine is of gemstone quality; in fact, the failure rate, particularly for large lab diamonds, is quite high. It will always be more expensive to grow a diamond than it is to mine a diamond. The high costs of mined diamonds are often a result of market inefficiencies resulting from a natural diamond changing hands 10-15 times from mine to market before ending up in a piece of fine jewelry. The financial costs of diamond growing, plus the time it takes to grow diamonds, insures that lab grown diamonds will not "flood" the market. Mined diamonds come out of the earth in the millions of carats per year; diamonds come out of labs in the thousands. Due to the efficient nature of the lab diamond market, lab grown diamonds are often available to consumers for 30-40% lower prices than equivalent quality mined diamonds. Lab diamonds are able to be fully appraised, insured, and re-sold, just like mined diamonds. Learn more about Ada's lifetime trade-in policy! Ada Diamonds is a bespoke fine jeweler of exclusively laboratory grown diamonds. Lab grown diamonds are chemically and optically identical to mined diamonds, have a transparent conflict-free origin, sustainable creation, and ~30-40% lower price.